Bowling Insert tape is for the expressed purpose of reshaping the gripping holes, and adjusting the holding force of the thumb during the swing of your bowling ball. Bowling tape is an important addition to a bowler's toolset, because it enhances consistency in your bowling game. There are two groupings of insert tape that are used for the thumb hole. The first is a textured white tape, and the second is a smoother texture or smooth tape. Let's face facts. Things change over the course of a bowling session. Here are a few things bowlers need to consider concerning their ball fit. Cool bowling center temperatures as well your at-rest thumb size may result in a thumb that is loose in the ball. You can insert textured tape to provide greater friction and grip when holding the ball. You may have to add multiple layers of tape until your thumb size is comfortable. As your body temperature changes during bowling you may experience an increased thumb size. As your hand heats up and your thumb enlarges, you may want to remove a layer of tape. As friction of the thumb against the thumb hole wears away at your thumb, it may be advantageous to apply a smooth bowling tape to the knuckle side of your thumb to reduce this unwanted friction. This allows you to avoid irritating or damaging the knuckle of your thumb. Inserting smooth tape on the knuckle side of your thumb can improve the stability of your thumb without providing too much unwanted friction. The web formed between the thumb and the hand can be irritated over time. Lengthening thumb knuckle tape or inserting tape where the pad of their thumb meets the hole can reduce potential irritation and inconsistencies in the way the ball separates from their thumb. 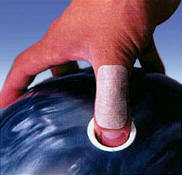 Textured tape is inserted into the thumb hole of a bowling ball to provide a snug, comfortable fit. Equally important, bowling tape is most often used to prevent slipping and grip problems during the release of the ball. If your thumb does not fit the ball, a consistent, effective capability to score is more difficult. Having a snug and comfortable fit in the thumb hole of the bowling ball is a necessity if you expect to have a relaxed swing with minimal gripping pressure. The bowling tape texture provides a gripping surface on the gripping side of the bole without having to grip the ball tightly. Insert tape provides an enhanced grip on the ball, and is critical if you expect to control the release and angle of the ball. 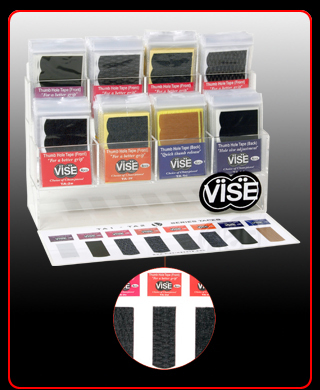 Insert tape is available having a wide variety of textures from smooth to a heavy texture. This variety of tape textures enhances the bowler’s ability to control the grip of the ball to match their specific needs that best ensures their thumb exits the ball smoothly without hanging up or slipping off the hand during the ball swing. Tape widths vary from ½” to 1”. Tape is in pre-shaped forms, packages and rolls. Bowlers often trim the length, width and tape end shapes to best match their specific objectives. Bowler thumbs can swell or shrink depending on temperature, humidity or repeated use during your bowling session. Bowling tapes provide an easier, more reliable way of responding to these unavoidable variations than altering your grip. When your thumb feels loose during your ball swing, you should avoid squeezing the ball until your thumb swells. Instead, bowlers tape can more reliably and consistently provide a comfortable fit. This is more vital than you may realize. Adjusting thumb and finger pressure is not only discomforting and inconsistent, but can also result in inconsistent ability to hit your target. During your game, if the ball feels like the ball is slipping off your hand too early, you can either add a piece of tape or select a heavier textured tape. If you feel that your thumb is too snug, you could either remove a piece of tape or select a lighter textured tape. First, let’s define a couple of terms. The front of the thumb hole is the side closest to the finger holes. Sometimes the hole area between the fingers and the thumb is also called the inside surface. The inside area is the gripping side of both the finger and thumb holes. The outside is the knuckle area of the holes. When inserting gripping area tape, the center of the tape is best applied to cover the pad of the thumb. Often that orientation is pointed directly toward the ring finger. Whether you use a tape insertion tool, the tape backing or a small instrument such as a knife blade, insert tape is most easily applied by pre-shaping, or folding, the curvature of the tape for easy insertion into the thumb hole. Insert a piece of textured bowling tape into the inside area of the thumb hole. Size the piece of tape so it reaches the bottom of the hole, with about 1/4-inch of space on the top. Insert a piece of smooth bowling tape into the back (the knuckle side) of the thumb hole in the same way as with the gripping tape, and with same length as the gripping tape, so that it rests along the wall where your thumb's knuckle goes when you hold the ball. This will help for a smoother, more consistent, release. Textured tape applied directly along the knuckle side of the thumb serves two purposes: to protect the knuckle from irritation, and provide a consistent surface as the thumb perspires during your bowling session. There are several textures selections that fine tune how soon the thumb exits the ball. Place a piece of smooth bowling tape onto the knuckle side of the thumb extending from the thumbnail upward. By starting from the thumbnail, the tape is less likely to become pulled upward as the thumb is inserted into the ball. You should put enough tape in the thumb hole so the ball doesn't slip but not so much that you have trouble getting your thumb out of the hole. Additional pieces of insert tape on top of the pieces in the thumb hole if the fit is still too loose. Overlapping additional layers of tape can make it easier to remove a layer of tape when that becomes appropriate. Finally, don’t hesitate to remove old tape and add fresh tape. Over time, tape adhesive degrades and can leave a sticky residue that can prove to be uncomfortable and difficult to remove. Keep your tape fresh. Confidence thrives on faithful protection and on performance.